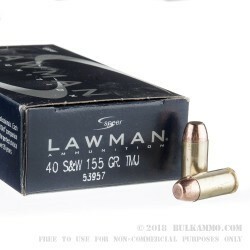 Speer Lawman ammunition is designed as a training companion for Speer Gold Dot hollow points; it replicates the more expensive product's external ballistics and felt recoil without the costly hollow point bullet. 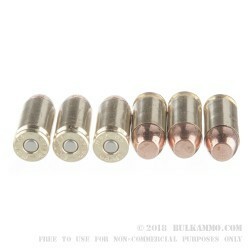 However, this .40 S&W ammo is an excellent choice for target practice regardless of what you carry. Each round in this case of 1,000 fires a light 155 grain total metal jacket bullet at a high velocity of 1,175 feet per second. 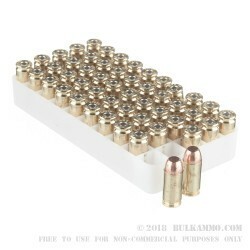 These specs line up with the corresponding Gold Dot load and other fast-moving, fast-expanding loads used for self defense. 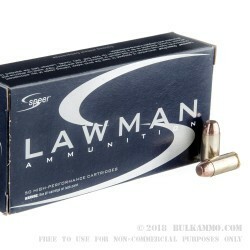 Lawman ammo is loaded in Lewiston, Idaho using non-corrosive Boxer primers and brass cases. The primers are made by Speer's sister company CCI and are famous for their reliable ignition.